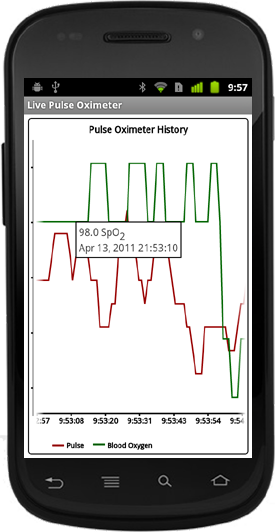 We are pleased to announce the release of our latest application, SimpleEye Live Pulse Oximeter into the Android Market. 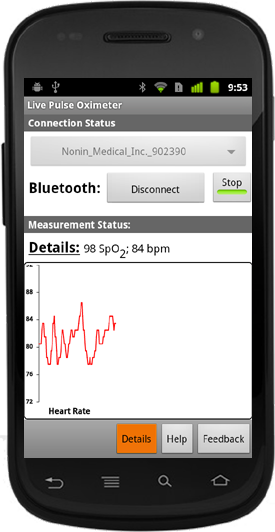 This is the next application in our health application series that extends our current range of single measurement applications to provide the Android Market’s first solution for recording of live blood oxygen and heart rate data from compatible Bluetooth pulse oximeters. 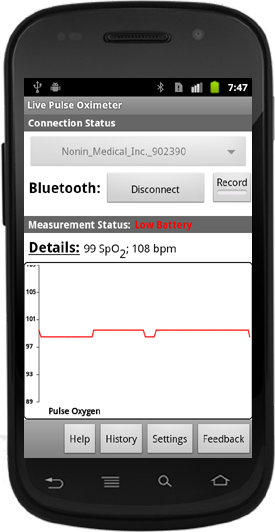 You can now record pulse oximeter data from supported pulse oximeters, including the Nonin 9560 II BT, on your Android device. 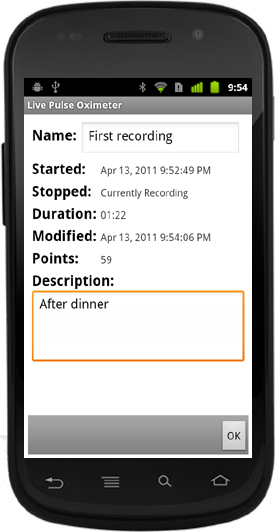 These recordings can be viewed in an interactive chart or shared over email. 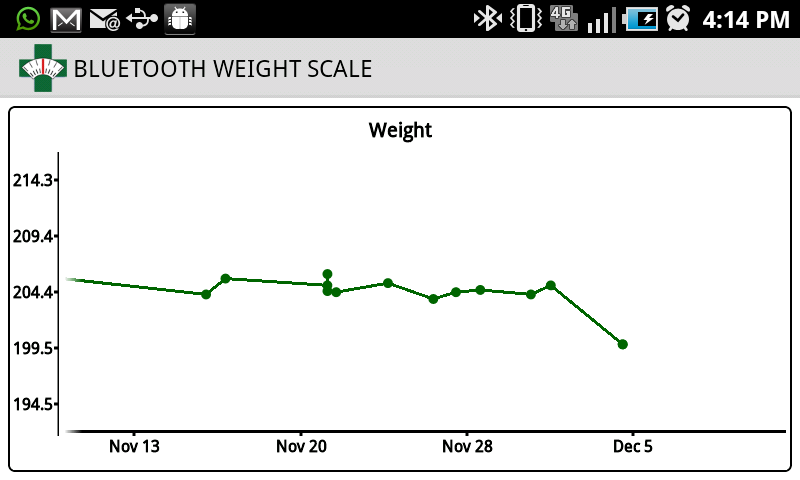 Finally: screen shots to show it off. 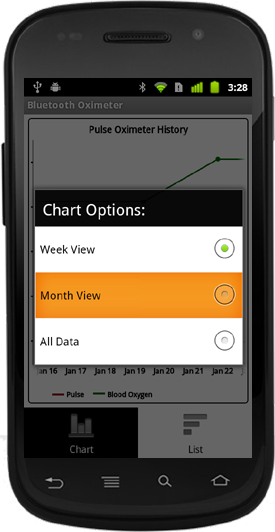 Shows a chart of the live blood oxygen values. 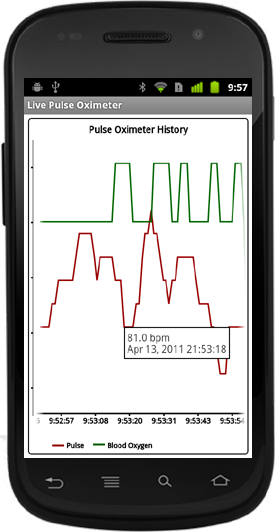 Shows a chart of the live heart rate values while recording. View a recording in an interactive chart. Share a recording by email. We had the distinct pleasure of talking with Doug Elwood at http://mhealth360.com recently about the state of the emerging mobile health market, and we were even more pleased when he expressed interest in interviewing us for the site. He raised a number of very interesting points and clarified some things for us. One of the obvious difficulties as a technologist in a field not driven by technology is translating the knowledge about the available technological capabilities into forms useful for the actual practitioners in the field, and Doug is one of the people leading the charge in the medical space. We’d like to thank Doug for giving us the opportunity to talk to mhealth360, and the full interview can be read at http://www.mhealth360.com/personal-and-mobile-health-interview-with-ideasynthesis-founder-olufemi-omojola/. A little late, but better late than never. Last month we launched our brand new website http://simpleeye.com/, dedicated to our set of mobile health solutions. The website gathers all the information about our applications, the medical devices they support, demonstration videos and additional documentation that has been developed since we started working on the solutions to improve your health. At SimpleEye, our goal is to provide our customers with a simple, reliable, powerful way to gain insight about their health: ultimately we want to help people get healthy, and stay healthy. We continuously strive to improve our offerings and will update this website as we come out with new releases over the coming year. 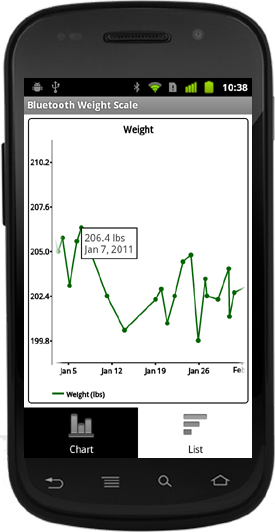 SimpleEye provides solutions and software that help you learn more about your health. 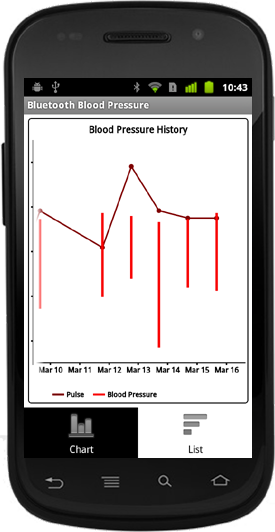 With the recent explosion in interest and availability of medical devices that measure physiological vital signs, we saw that there was a need for a suite of software that allows simple and secure collection of information as well as identification of healthy trends so you can get healthy and stay healthy.